A3, A5 contain parts of Carl Orff: Carmina Burana (O Fortuna), © Schott Musik International. Used by kind permission of Schott Musik International. B2 Samples taken from Vocal Chant: "Jubilant Drinking Song" arranged and performed by Kuo Ying-Nagi and Kuo Shiu-Chu of the Ami tribe, Taiwan R.O.C. C1 Samples: Gregorianische Gesänge Choralschola der Capella Antiqua München by courtesy of Polydor GmbH. C4 Samples: Paschale Mysterium, Choralschola der Capella Antiqua München by courtesy of BMG Ariola Hamburg GmbH. D2 Samples taken from: Gregoriani Cantus/Pierre Kaelin with kind permission of Tudor Records. D3 Sample extracts from the album "Songs From The Victorious City" performed by Anne Dudley and Jeremy "Jaz" Coleman on China Records. ℗ 2016 Baloo Music S.A., under exclusive license to Polydor/Island. © 2018 Polydor/Island, a division of Universal Music GmbH. Universal Music International B.V. Gerrit van der Veenlaan 4, 3743 DN, Baarn, Netherlands. "Enigma Songs" appears as "Enigma Songs Edition". "Data Alpha" appears also as "Data Alpha Editions". Cat# on spine & inlay "573 652 8", in runout "5736528". 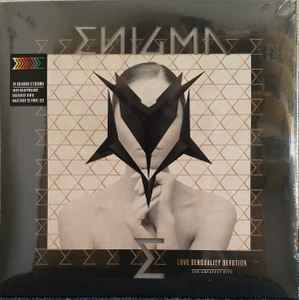 Title on spine appears as: "Enigma‎ • LSD • The Greatest Hits (Love Sensuality Devotion)"
Am I imagining things or has the Midnight Man Mix of TNT for the brain been used instead? I have to confirm the problems mentioned from another user. At the end of side 3 the sound is noisy due to debris stuck and unfortunately the last song is unplayable while fading out. The needle stucks just 10" before the end of the song! It doesn't make sence for me to return the LP, because I don't want to receive another 4 or 5 copies with the same or worse problem, until I receive a good one. So I'll keep it just for my collection, avoiding to play the last song on side 3. Although the mastering reminds me more on CD than on LP, I could be happy with this release and its beautiful cover. But I don't suggest to anyone to give it a try! Only if you just want to collect it. There is a high possibility for you to get a problematic copy. No particular problems with my copy. Decent inherent volume. I'm happy with it. Not a bad pressing at all! Sounds pretty good, albeit a bit on the loud side. The clear vinyl looks nice, and it's overall a great purchase. Though I do have to say I'm shocked at the poor quality control on this series of albums. Of the six I've received so far, four had to be returned due to debris stuck on the vinyl that wouldn't come off. Hopefully the remaining three won't have this issue!